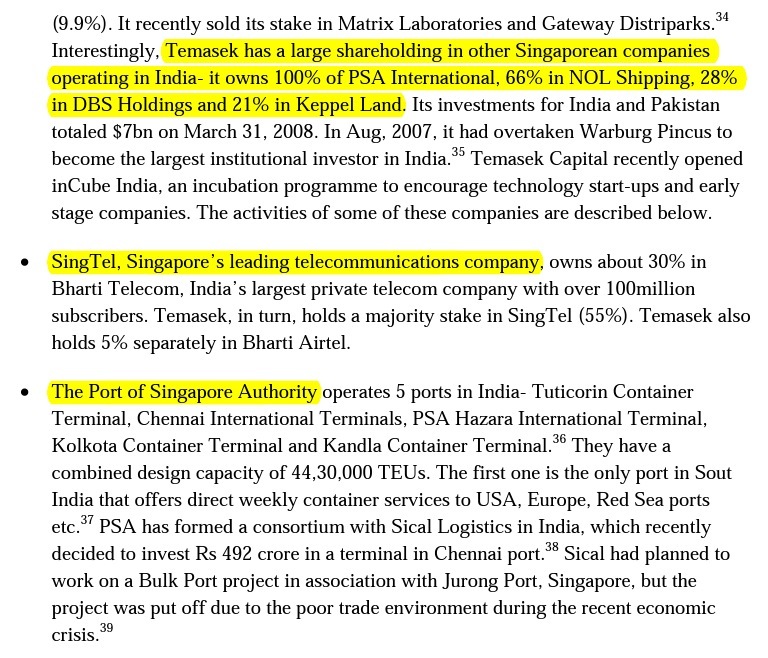 The government has always told us that Singapore shouldn’t introduce laws to hold companies accountable, right? The government had kept saying that we should “convince” companies to be “fair”, because “laws” might be too harsh. Even the recently-introduced ‘Fair Consideration Framework’ isn’t a new law or policy and there is no legal bite or teeth in this “framework” if companies flout this “framework”. Do you know that the reason why Singapore cannot introduce any laws or policies to protect the employment of Singaporeans is because that in the CECA, there is a clause which prohibits this? It is said in the CECA that both India and Singapore should not “require labour market testing” (Chart 1). In other words, labour movement between countries is “free and easy”. Maybe you might be thinking that – but this clause most probably exists across all of India’s CECA with the other countries. So, I looked the the agreement with Malaysia. But Malaysia’s agreement doesn’t have a clause like this! It also said that for both countries, the allowance of applicants entering and extending their stay in the country should be “in accordance with domestic laws and regulations (Chart 2). Thus in the agreement with Malaysia, at least Malaysians are given the due respect in the eyes of the law. So, I thought I would look at another agreement – I looked at the agreement between India and South Korea. 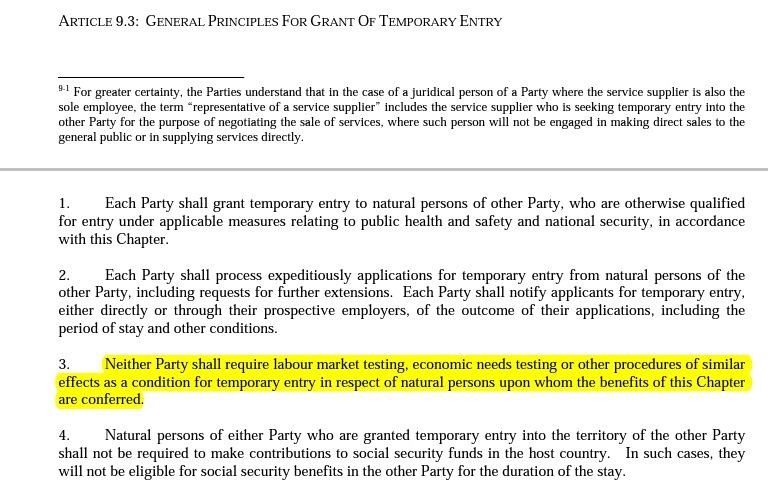 Again, there is no such clause that prevents both countries from being able to “require labour market testing” (Chart 3). Again, the South Koreans are protected by their government. But if you look back at the CECA between India and Singapore again, not only does the CECA makes it easy for anyone to come into Singapore without adequate “testing”, their “spouses or dependents” are allowed to do so as well. In the CECA between India and Singapore, the countries are expected to allow “spouses or dependents … the right to work as managers, executives or specialists (and) … they shall not be barred by the Party (both countries) granting them the right to work from taking up employment … on the ground that they as the accompanying spouses or dependents or already employed” in the same job role specialisations (Chart 4). So, again I compared Singapore’s agreement with Malaysia’s. And again, Malaysia’s CECA had more accountability towards its people and the laws of the country – it stated clearly that the granting of the “spouses and dependents” to work should be “in accordance with that (country’s) domestic laws” (Chart 5). And again, South Korea’s agreement also ensured that the laws of its countries are respected and its citizens are protected – it said the same thing: “the spouse or the dependent (has to comply) with immigration measures” (Chart 6). 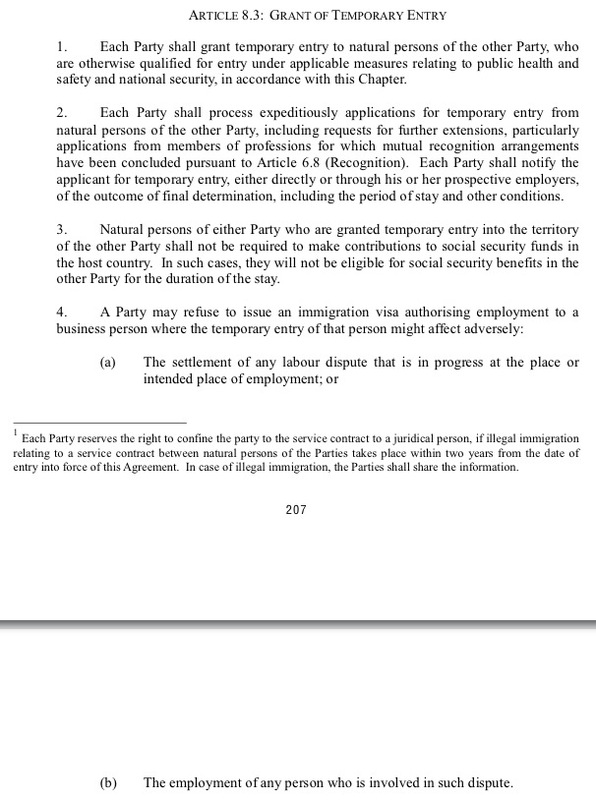 So, why does Singapore make it so damn easy for anyone to come into Singapore, when the other countries would at least ensure that their laws would protect the employability of their citizens, and ensure that even as they enter into agreements with other countries, that other countries also respect their laws? Why can’t Singapore do the same? I looked at another article on the evaluation between the India and Singapore CECA, and inside, it said that in order for Singapore to “benefit from this relaxed visa regime” to allow for a more liberal movement of labour on both sides, “Singapore must accept Indian professional qualifications in order to benefit” (Chart 7). This explains why that on top of the lax allowance of anyone to enter, the perception that lower standards, in terms of educational qualification, is being allowed into Singapore seems to be on the rise here. 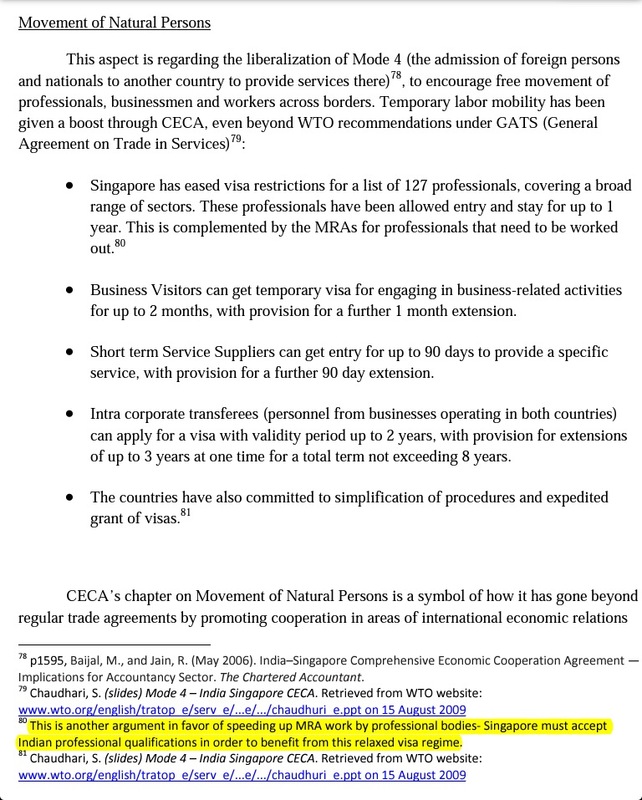 It is no wonder that it has been said that, “India is inclined to take up the CECA model in line with the Indo-Singapore experience wherever possible due to its potential gain in services sector” and that “the Indo-Singapore CECA has been the most successful model agreement, which the Indian negotiators may refer to from time to time during future negotiations” because “the agreement provides for investment liberalization commitments on the part of India on a positive list basis” (Chart 8). Indeed, it has been reported that the “CECA dictates that the government in Singapore should provide additional protection to Indian employees as the countries agreed on a partnership which would protect its migrants”. Isn’t it ironic that in the CECA that the Singapore government signs with India, the Singapore government would wittingly sign away the rights of Singaporeans but are expected to protect the citizens of another country? Where is the allegiance of the PAP government? The situation has exacerbated so much so that the Singapore government has allowed Singapore to be held ransom such that India would be as much as “irked” that tightening of the Employment Pass Framework “does not give India a preferential treatment incorporated in the Comprehensive Economic Partnership Agreement“. What that had got into the PAP government’s head to allow for such an agreement is beyond anyone’s logical understanding. But do you know that not all agreements that the Singapore government signed with the other countries would sell away Singaporeans’ rights so easily? 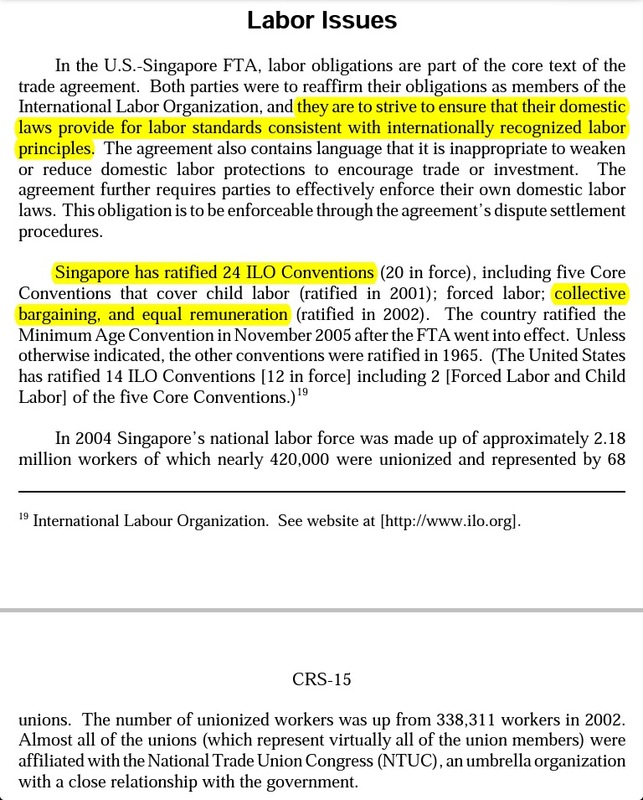 If you look at the Free Trade Agreement (FTA) that Singapore had signed with the US, it includes a lot more clauses which protect labour rights. So, the question is – if the Singapore government has shown that it’s capable of protecting Singaporeans (at least (just) in writing, mind you), then why did it allow all hell to break loose with the CECA with India? In a report of the US-Singapore FTA after a three-year period, it was said that both the US and Singapore “are to strive to ensure that their domestic laws provide for labor standards consistent with internationally recognized labor principles”. Apparently, Singapore “has ratified 24 ILO Conventions” which also requires Singapore to allow for “collective bargaining, and equal remuneration” (Chart 9). Sounds good, right? But do you even feel that you have “the right to organize and bargain collectively”, even as the US-Singapore FTA had mandated? Indeed, it has been advocated by the Citizens Trade Campaign (CTC) (a national coalition of environmental, labor, consumer, family farm, religious, and other civil society groups in the US) that the US-Singapore FTA is “dangerous” because it is inadequate, as the “US-Singapore FTA is contingent only that Singapore enforce its existing labor laws regardless of their adequacy”. 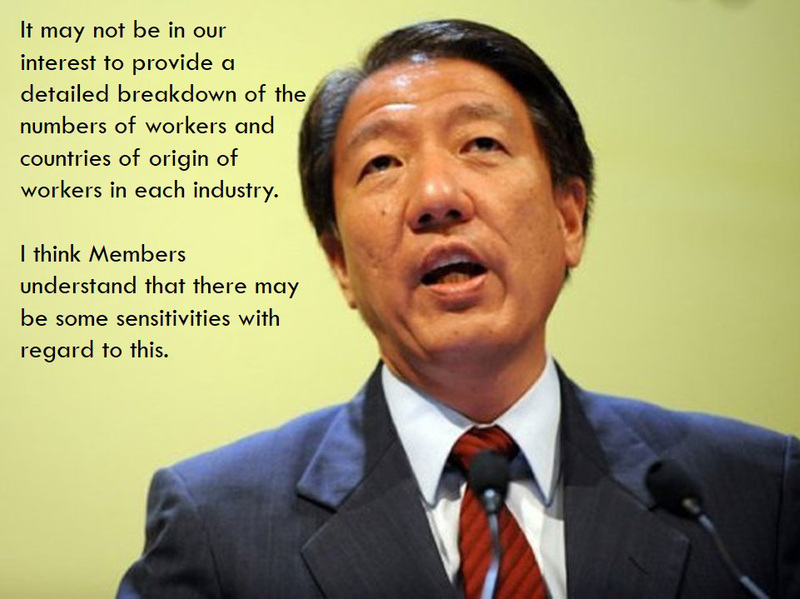 Also, the CTC recognises that this FTA, “sets up a mechanism to abuse Singaporean workers and drive down wages and working conditions in the US.” Even the civil rights group in the US had to speak up for the Singaporeans, who are unaware of how the Singaporean government had turned their backs on us. In fact, the US-Singapore FTA had also mentioned how both countries should maintain “acceptable conditions of work with respect to minimum wages (and) hours of work” (Chart 10). But what minimum wages? What acceptable “hours of work”? By now, you would know that there are 90% of countries in the world which already have minimum wages and Singapore is one of the very few countries which still does not have minimum wages. At the same, Singapore works the longest hours in the world. What “acceptable conditions”? So, when you read further, you realise that the Singapore government had described “minimum wage” as “wage guidelines issued by the National Wages Council (‘NWC’) and gazetted under the Employment Act. Wait, even this can be called “minimum wage” (??) and the US government allowed this agreement to go through? But do you know what “minimum wage” the NWC had recommended? This is what the NWC had recommended: “The NWC recommends that real wage increases should be in line with productivity growth over the long term” (Chart 11). What “minimum wage” is this?? And when you read further, the NWC had also recommended that “companies employing workers earning a basic monthly salary of up to $1,000 grant these workers a built-in wage increase of at least $60” (Chart 12). What this means is that if you earn $600, the NWC recommends that you should get $660. So, if you earn a lower amount, say $400, you would get $460. There is effectively no “minimum wage”! What’s worse is that the NWC then further said that “as of December 2012, almost 6 in 10 of private establishments gave wage increases to their employees”, which means that there were more than 40% of companies which did not give their employees any wage increases! Which means that this “pseudo minimum wage” didn’t even get to more than 40% of the low-wage workers in Singapore! So now, do you know why Singaporeans will never be protected under the PAP government in our jobs? But who actually benefits from the CECA? Take a look at Chart 13. In short, Singaporeans are not the ones benefiting from the CECAs and FTAs. But the question is – whose interest is this not in, and so, why would the Members of Parliament understand these sensitivities? And why not, right? So, now, do you know why he said this? If so, if the PAP government is not protecting the Singaporean worker, then who is the government protecting? Or what? For goodness sake, there are 1 billion people in India. If the PAP government doesn’t already understand this, India is the country with the second largest population of 1 billion in the world and Singapore happens to be one of the smallest countries in the world! Seen in this light, it would’t take a 8-year old to understand how such an overly porous labour and border policy in these agreements is completely unsound, let alone that for a PAP minister to understand. What was the PAP thinking, or actually, what were they not thinking?? I read a comment on another article, where someone said, “it’s a sell out (of Singaporeans)!” I think he sums it up just nicely. There is no other way to say it – we’ve been had.